Saffola Masala Oats - Better Taste! Better Nutrition?? Read On! I know a very few people who like to eat oats! 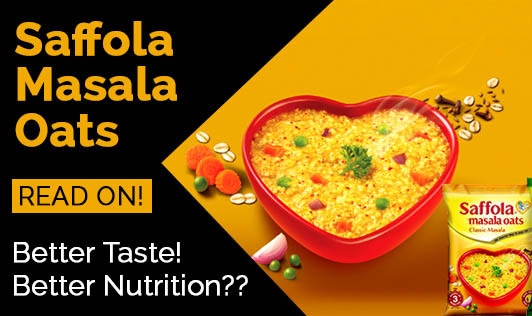 Saffola has introduced instant masala oats for the people who hate homemade oats porridge. Most of us do not like to eat that slimy dull white coloured oats porridge. But don't really have a better and healthier option to go for in the morning rush hours. They have two different flavours, curry n pepper and masala n coriander... both suitable for the Indian palate. It is easy to prepare, ready in 3 minutes, packaging looks attractive. Tastes much better than oats porridge and so has appealed to many of us. The look and feel of this food product is really tempting... let's see if the nutrition box is! These two little packets of masala oats contain around 74% oats, which is a good amount to look at. But also contains certain ingredients which kind of defeat the purpose of having oats. It contains corn starch, wheat flour, dehydrated vegetables, emulsifiers, flavouring agents, etc. As we know any processed food is not a very good option for those conscious about their health. This one (supposed to be a healthy option to plain oats) does contain synthetic ingredients. It also contains vegetable oil, and in addition to which the cooking instructions ask us to add 1 tsp of oil to it. This very obviously increases the fat content of your yummy breakfast bowl. Most of us have oats for breakfast, as it is healthy, low in fat, high in fibre and many other nutrients. Saffola Masala Oats have all the above nutrients with a considerable amount of fat and a dash of emulsifiers and flavouring agents! It can be a good option for those staying in hostels or as paying guests, who cannot cook at home, so are forced to eat unhealthy. Not as an everyday option, but as a once in a week option. A Dietitian would be able to help them choose healthy meal options according to the availability. Are we choosing health or taste? Be careful when you pick any processed food from the supermarket. It always comes with a clause! Hope you enjoy healthy eating for a healthy life!